Situational awareness: Trump tweeted today that his administration is "giving strong considerations to placing Illegal Immigrants in Sanctuary Cities" today, following a story published yesterday by the Washington Post. "We are giving very strong consideration to having people, after a 20 day period — because legally we’re not allowed to hold them for more than that — we will move them to sanctuary cities," he said. Video. WashPost: "Following Trump’s tweets, a Department of Homeland Security official said DHS is not drawing up plans to implement the proposal. The official requested anonymity to contradict the president." Two Americas: While Big Tech is increasingly on board with helping Americans emulate the rest of the world on cashless payments, there's a growing backlash at home against stores that don't take cash. Between the lines: The push against cashless is reaching companies, Axios' Erica Pandey reports. It began in Philadelphia and has since spread to New York, D.C., Chicago, San Francisco, and beyond. The big picture: "The U.S. still leans on cash. Around 30% of all U.S. business is still done in cash, not credit cards — some 14 million Americans have no bank account," Erica wrote in March. "Over the last two years or so, Chinese tech giants Alibaba and JD.com have wholly eliminated checkout in hundreds of stores. American counterparts Amazon and Walmart, meanwhile, are only starting to debut such technology in a few flagship locations." 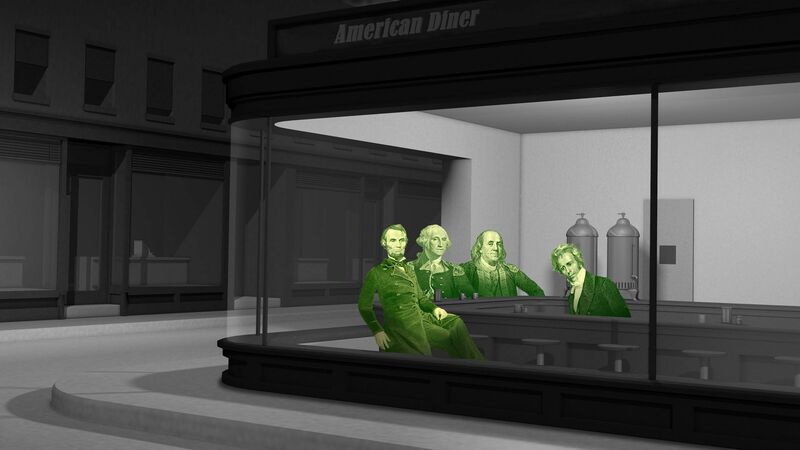 "But unlike in China, local U.S. movements are working to keep cash alive. The trend was first reported by Tim Carmody's Amazon Chronicles." 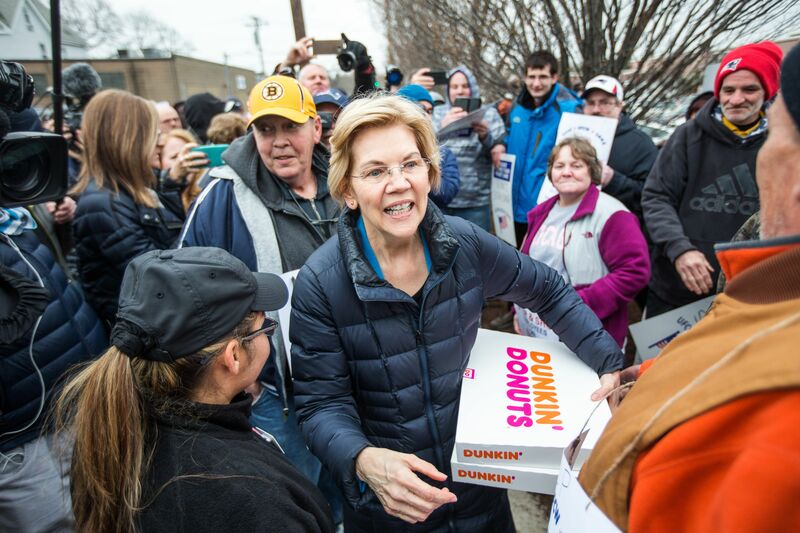 Elizabeth Warren shakes hands and greets striking Stop & Shop workers while also bringing coffee and donuts in Somerville, Massachusetts. 31,000 unionized Stop & Shop workers across New England walked off the job yesterday in an ongoing strike in response to a proposed contract which the United Food & Commercial Workers union says would cut health care benefits and pensions for employees. The Arctic region has been pushed into an entirely new climate, one that's outside the experience of longtime residents and native wildlife, according to a new report in the journal Environmental Research Letters. The trade war isn't breaking China's economy: It appears that policymakers are adding credit growth to all the other stimulative measures like tax cuts, infrastructure spending and preferential policies to keep the economy stable. Details. The World Health Organization declined today to declare a "Public Health Emergency of International Concern" despite a sharp uptick in the number and geographical spread of cases of the Ebola virus in the Democratic Republic of the Congo. Chart. Manafort associate Samuel Patten was sentenced to probation by a federal judge after he pleaded guilty last year to helping steer Ukrainian money into President Trump's inaugural committee, the Washington Post reports. 2020 candidate Pete Buttigieg's increasingly tough back-and-forth with Vice President Mike Pence is only the latest chapter in a political saga that predates the 2016 election and Buttigieg's 2020 presidential run. Go deeper. Between the lines: There are tons of questions the series needs to answer, like how lovers Jon Snow and Daenerys Targaryen will find out they're related (and what they'll do about it), if Arya will kill cruel Cersei, who'll reign supreme in the epic fight between the living and the dead, and ultimately who'll sit atop the Iron Throne. The longest consecutive battle sequence ever committed to film. Shooting it took 11 weeks and more than 750 cast and crew members, reports Entertainment Weekly. Reunions galore. The Starks finally reunite. Other anticipated reunions include Arya and the Hound, Jon and Sam, Sansa and Tyrion, and many more. The biggest musical ensemble yet, with a 60-piece orchestra, 40-voice mixed chorus and 12-voice children's choir (via Variety). A breathless James Corden boiled down the previous seven seasons into a four-minute clip. Don't miss this riveting account in The New Yorker of how Emilia Clarke (Daenerys Targaryen) suffered two life-threatening aneurysms while filming Season 1. Five GoT prequels are in the works, including one that explores the origins of the white walkers, the mysteries of Essos, and the Stark family. P.S. The new Star Wars trailer is out today. Episode IX will be "The Rise of Skywalker." Video.